Kudos to brilliantly witty cruising cartoonist Sarah Steenland for cannily capturing what tropical cruisers do for the holidays versus "the rest of us." Check Sarah Steenland's FB page to tickle your funny bone some more. Last year we celebrated Christmas day getting an all-over tan on one of Sydney's sunny beaches. The prior four years we joined fellow cruisers in festivities, whether it was a get-together at a local restaurant or a potluck on the beaches of New Zealand. This year's celebrations start after I close the evening tills at West Marine, exiting into freezing temperatures. At least we close an hour earlier that night. "Gift cards, anyone?" Wayne works Christmas night, his usual graveyard shift at Horizon Air. Christmas afternoon, thanks to prompting from a good friend, we'll resume our US "Jewish Christmas" tradition of the movies and Chinese food out. After 5 years, it was nice to light my menorah for Hannukah -- one of the few items we kept in our minimal storage whilst cruising. For the first time in my life, I had to jog my memory for some of the Hebrew blessing over the candles. That was a shocker. It came back quickly -- whew! As live-aboards, Wayne viewed my little nordic pine, our lone concession to Christmas decor as "one more thing on the counter." Clutter is the enemy in small spaces. I found it a better home. The ability to catch up with my scattered family for the holidays over US phone systems -- if not in person -- was nice. Part of our return here was prompted by a desire to spend time with family. Bit by bit we're making the rounds. 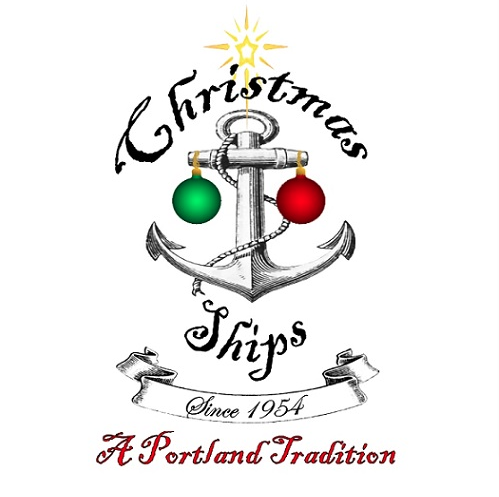 Crossing the Sauvie Island bridge, we caught the tail-end of Portland's fabulous Christmas ship parade on the way to a colleague's marina. There we joined the congenial crowd, toasting to the ship's passing and swapped cruising tales in the marina's aptly named and unapologetically ramshackle "Man Cave." Cruising taught us it is presence, not presents that make our most cherished holiday memories. We have no idea where we'll be in a year. Wherever you are, whatever you're doing, whoever you're with in spirit or in real life -- we wish you a Happy Holiday and an Awesome New Year. Especially, Steve and Patty of Armagh, who our best Christmas gift would be finding out you've arrived safely in Hawaii after you long passage from Samoa. We're hunkered in Portland Oregon (N45.47.449 W122.47.189), living aboard the good ship Serendipity, where we still embrace a relatively simple lifestyle, thanks to the generosity of our friends Larry and Nancy. Please pardon the light posts. There really truly are still some catch-up posts and still some adventures ahead. Meanwhile, when not working or doing some freelance writing gigs, my writing time is getting gobbled to complete my first e-book -- about cruising! The goal is to finish it in time to be orderable for Seattle's Boat Show in late January. Just started it about a week ago - so it will be a push.